I have just returned from a few days in Devon with a small group of people who are all working towards gaining their diplomas in applied permaculture design. It was billed as a ‘support event’, which sounds like a potentially rather dull way to spend a weekend. However, nothing could have been further from the truth… I have not laughed so much for ages. We laughed until we cried, we laughed until we were incoherent, sometimes we laughed because we were incoherent, we laughed over breakfast, lunch and dinner and late into the night. They say that laughter is the best medicine, and I think it might be addictive. It sounds like an enjoyable way to spend some time but not very productive. The funny* thing is, though, that I have come back home inspired and with a significant amount of work done on my diploma portfolio. I did some work on my waste of space design, including a base map and an overlay for my year 1 planting along with some notes about this design. However, the most useful part of the weekend in terms of taking my portfolio forward was a discussion about my business plan. I want to generate a small income from making things. My original plan was to make and sell my knitted snails and other permaculture teaching tools, but that has rather stalled over the months and my interest has grown in items like the bath puffs and other items with a wider potential market. As a result of all the discussions, I have started to see first, that I don’t at the moment want to concentrate on teaching tools and, second, that I’ve had the wrong attitude to my creations. For example, until now, I have had a tendency to say ‘yes’ when people ask me to make something for them, even when they don’t offer to pay. 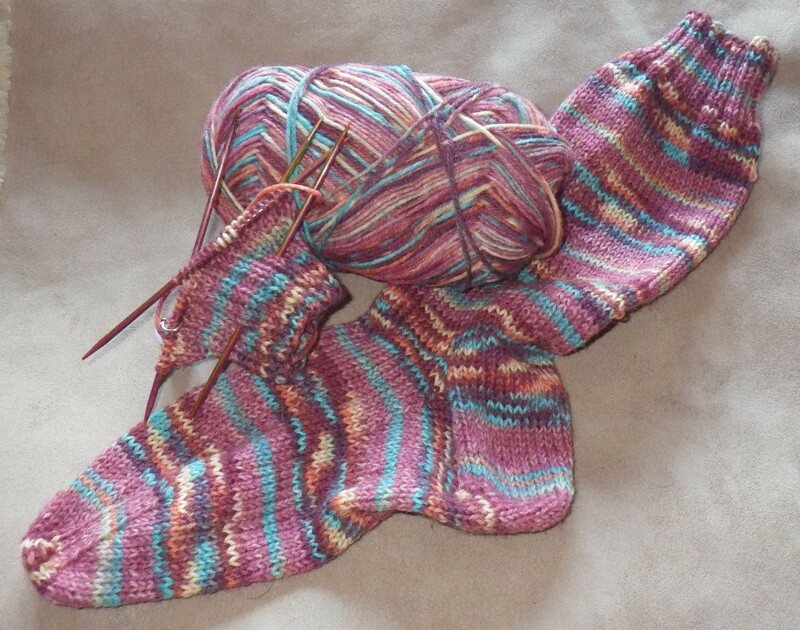 I am currently knitting two pairs of socks for a friend (total knitting time about 40 hours)… and in exchange they will be very grateful and cook me dinner. It’s not exactly a fair exchange if crafting is to be my business and so it has to stop… it is a sock too far! So, the current project will be finished and handed over, and then the business will commence. I will begin by building up a stock and I will plan to sell that stock at an event… perhaps a Christmas fair. I’ve just thought of the answer that isn’t ‘no’! It’s ‘yes of course I will, and they’ll be available for you to buy at **** Christmas Fayre so start saving your pennies’ !!!!!!! Thank you Snuffkin… I can now relax about making things and I can complete my business design, start making my stock and head towards both an event and an etsy shop. So, next time you’re stuck for a way forward, get together with some people you have something in common with and have a good laugh! * Yes, the pun was intended… there were lots of those over the weekend too thanks to Corky who has a sort of punning Tourette’s syndrome! I think your friend snuffkin is right – your friends need to start valuing what you do for them in a realistic way – the challenge, with friends, is to do it in a way that doesn’t offend them – have you thought of a strategy for this? One of the big issues for our movement is to create a system of exchange that works as well (sic) as capitalism without creating the inequities that the ‘hidden hand of the market’ – gloves maybe? Thanks, Gary. By nature I am quite generous, so I do find myself doing things for nothing. My hope is always that I will get back as much as I give and this works with some (but not all) of my friends. I’d love to do more bartering, but a direct exchange is not always possible. I’m sure this is something that’s going to occupy my creativity for a while. And in my case the hand of the market would only be partially hidden, because I only do fingerless gloves!!! You are so right- I have just been asked to crochet a hat- I still won’t charge her for it but it will now be her birthday present! And laughter is so good for one, I so agree. I think I’m just too nice! Anyway, the answer now is about building up a stock of things to sell; I hope people will understand this better than saying no. We had tons of tomatoes last year- had them coming out our ears! Now barter is a top notch idea! Can you ship them to west Wales? Oh, but I’m trying to reduce food miles too! Mother lives in the Brecon Beacons! I like your “a sock too far”. 🙂 I think people don’t really understand the amount of work that goes into something seemingly simple like socks or a hat, so they unintentionally devalue it. I don’t think I can create stock fast enough to do regular markets, but I could probably manage a couple a year plus the etsy shop. The final sock is now being referred to as ‘the sock of resentment’!! Actually, I should regard it with gratitude – it’s made me realise what I’m doing and is a turning point, I think. The sock of resentment should go in a frame. 🙂 Although that means you have to knit resentment sock Mark II in order to keep you promise to supply the pair!